We describe how to visualize macrophage-C. neoformans (Cn) interactions in real time, with specific emphasis on the process of non-lytic exocytosis using digital light microscopy. Using this technique individually infected macrophages can be studied to ascertain various aspects of this phenomenon. Stukes, S., Casadevall, A. Visualizing Non-lytic Exocytosis of Cryptococcus neoformans from Macrophages Using Digital Light Microscopy. J. Vis. Exp. (92), e52084, doi:10.3791/52084 (2014). Many aspects of the infection of macrophages by Cryptococcus neoformans have been extensively studied and well defined. However, one particular interaction that is not clearly understood is non-lytic exocytosis. In this process, yeast cells are released into the extracellular space by a poorly understood mechanism that leaves both the macrophage and Cn viable. 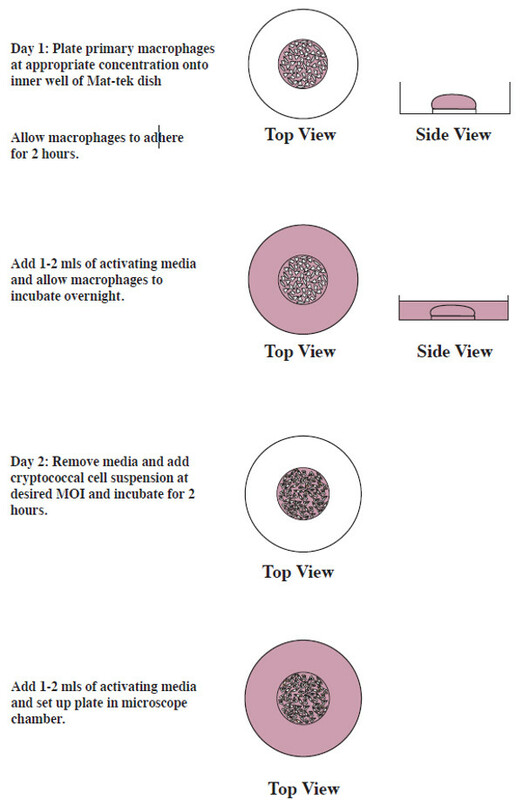 Here, we describe how to follow a large number of individually infected macrophages for a 24 hr infection period by time-lapsed microscopy. Infected macrophages are housed in a heating chamber with a CO2 atmosphere attached to a microscope that provides the same conditions as a cell-culture incubator. Live digital microscopy can provide information about the dynamic interactions between a host and pathogen that is not available from static images. Being able to visualize each infected cell can provide clues as to how macrophages handle fungal infections, and vice versa. This technique is a powerful tool in studying the dynamics that are behind a complex phenomenon. The stages of a fungal infection between cryptococcal cells and macrophages are well documented 1-3. After yeast cells are ingested by macrophages, a variety of interactions may occur: the macrophage may lyse releasing its fungal load into the extracellular space, or it could control the infection by keeping the yeast cells within the confines of its cellular membrane 4. However, several years ago a new outcome was described independently by two groups: non-lytic exocytosis, a process in which a macrophage expunged some or all of the cryptococcal cells into the surrounding environment or a neighboring cell and both host and pathogen remain viable 5-8. Several studies have attempted to understand the molecular mechanisms behind this interaction but we still do not have a full grasp on what drives this phenomenon. The capability to capture images in real-time and then subsequently analyze multiple infected macrophages allows one to answer many questions about the physical properties surrounding non-lytic exocytosis in regards to timing, spatial capacity, change in morphology and even stress of macrophages during a fungal infection. By allowing the cells to be housed in an environment that is comparable to that of an incubator, we can glimpse the dynamic nature of macrophage-fungal cell interactions. Researchers have used this technique to study various components of this process. The role of the phagosome in this process was made apparent using fluorescent staining and actin blocking agents 9, while another group used this method to show that non-lytic exocytosis was blocked in cells that have had the WASH nucleating protein domains deleted 10. The effect of cytokine signaling has also been ascertained using real-time microscopy 11. This process is not limited to C. neoformans as it has also been observed with Candida albicans, another fungal pathogen that has the capability to infect macrophages 12. These findings are examples of how this method can provide a wealth of information to an area we know so little about. All animal work was done in accordance with regulations and guidelines of the Institute for Animal Studies at Albert Einstein College of Medicine. Grow individual C. neoformans (Cn) colonies on Sabouraud agar plates. One day prior to the experiment, select one colony and inoculate 10 ml of Sabouraud broth. Allow culture to grow overnight at 37 °C shaking at a speed of 250 rpm. Euthanize mice by placing animal in a CO2 chamber until no longer breathing. As a second measure, cervically dislocate the neck before beginning dissection. Sterilize entire body with 70% ethyl alcohol. Remove both femurs and tibia and place bones in sterile DMEM. Remove excess tissue and muscle using delicate wipes until bones are completely clean. Place only intact bones in a Petri dish containing 70% ethyl alcohol and incubate for 3 min to kill associated microorganisms. Remove bones and place in Petri dish with sterile DMEM. Carefully cut ends of bones. Hold bone over an empty 50 ml conical tube placed on ice and carefully flush 10 ml of cold DMEM using a 25 G needle through each bone. NOTE: Each mouse will yield 4 bones (2 femurs, 2 tibias). Therefore one mouse should yield approximately 40 ml of cell suspension. Centrifuge cell suspension at room temperature for 10 min at 650 x g.
During this centrifugation, prepare and filter sterilize bone marrow macrophage feeding media which consists of DMEM supplemented with 20% L929, 10% fetal calf serum, 10% NCTC-109, 1% Pen-Strep, 1% HEPES, 1% L-Glutamine, 1% non-essential amino acids, 0.1% 2-Mercaptoethanol. Resuspend resulting pellet with 10 ml of feeding media. Pass cell suspension through a 70 µm cell strainer to disrupt cell clumps and remove large debris. Plate 1 ml of cell suspension into 10 ml of feeding media in Petri dishes that are specified for tissue culture use (for a total of 10 plates). Allow cells to adhere at 37 °C with 10% CO2. Add 5 ml of fresh feeding media on day 3. On day 7, completely replace the feeding media and macrophages are ready to be used. The day prior to the experiment, detach macrophages from plate by removing feeding media and add 5ml of a gentle cell stripping reagent to plate. Incubate for 5-10 min at 37 °C and remove macrophages with gentle pipetting. Pellet cells by centrifugation at 650 x g for 10 min. Resuspend pellet in 1 ml of feeding media. Using a 1:20 dilution, calculate the concentration of macrophages by pipetting 10 µl of cell suspension onto a haemocytometer. Using 14 mm glass bottomed Petri dishes, plate a concentration of 1 x 105 macrophages directly onto the inner well which holds a maximum of 200 µl, so take caution to not exceed this volume as shown in Figure 4. Allow the cells to adhere to the glass Petri dish by placing the dishes in a 37 °C incubator for 1 hr. Add 1-2 ml of feeding media supplemented with LPS at 1 mg/ml and IFNg at 500 u/ml and allow cells to incubate overnight. On the day of experiment, remove 1 ml of overnight inoculated culture and pellet yeast cells by centrifugation for 5 min at 420 x g.
Wash cells 3 times with sterile PBS to remove media and extracellular cryptococcal products like the polysaccharide glucuronoxylomannan (GXM) at the speed and time mentioned above. Resuspend cell pellet in 1 ml of sterile PBS and make a 1:100 dilution. Pipette 10 μl of the dilution onto a haemocytometer and count cells. Add yeast cells at a MOI of 1:5. For example, if there are 1 x 105 macrophages/well, make a cell suspension of 5 x 106 /ml of Cn and add 100 µl of this solution for a total amount of 5 x 105 Cn. Add calculated volume of cryptococcal cell suspension to 1 ml of feeding media with the mAb 18B7 antibody at a concentration of 10 μg/ml. Incubate cell suspension at room temperature for 5 min. Remove feeding media from glass bottomed Petri dish and wash 1x with sterile PBS. Add 100 μl of opsonized Cn directly to well. Allow cells to incubate for 2 hr at 37 °C with 10% CO2. After co-incubation, check by microscope that macrophages have internalized Cn. To be considered internalized, cryptococcal cells should clearly be seen within the confines of the macrophage. Wash Petri dish 3x with sterile PBS to remove any and all extracellular Cn. Add 1-2 ml of feeding media without the addition of mAb 18B7, and set up microscope. NOTE: To perform these experiments, a microscope that comes with an attached incubating chamber that includes CO2 delivery and a heating unit is required. Prior to the experiment, pre-warm the incubating chamber for at least 30 min to 37 °C. Ensure that the CO2 unit reads 5% at the start of the experiment. Place glass bottomed Petri dish on microscope platform, cover with CO2 lid, and close all doors to ensure no heat escapes. Using the 10X objective with the microscope in phase contrast, focus on a clear field of infected macrophages. Based on the experiment, determine the objective used by how many macrophages need to be studied. Set up microscope software to take an image every 4 min for a 24 hr period. After 24 hr, the experiment will have reached completion and a total of 361 images will have been collected. Export these images as .jpegs at a 5% compression. Using Image J software, view images as a Visual Stack at 5 frames per sec. If the movie needs to be viewed for publication or a presentation, save it as either an .avi or .mov file depending on which format works best for the viewer. 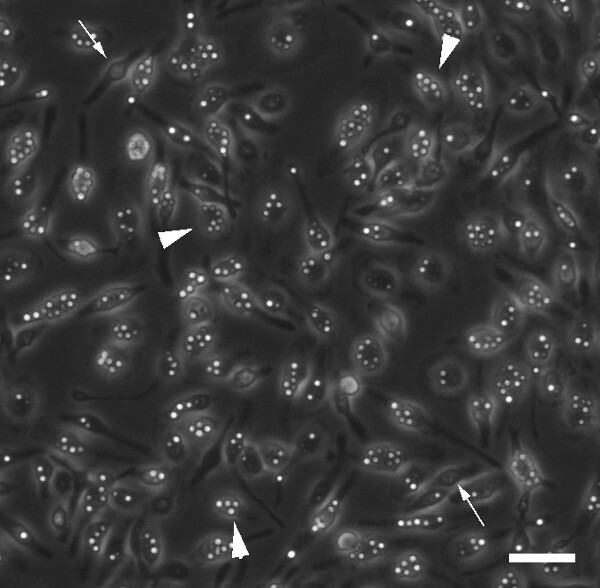 The images that this technique produces can be analyzed in a variety of ways to collect information surrounding what happens after cells have phagocytosed C. neoformans. As seen in Figure 1, there are approximately 100 macrophages that are either infected or uninfected. Each one of these macrophages gives the viewer an opportunity to study host-pathogen interactions on a very microscopic level. As Figures 2 and 3 show, there are different outcomes that can occur between a macrophage and yeast cell, and even between macrophage-macrophage. Macrophages can be scored as undergoing non-lytic exocytosis, cell-cell transfer, or any other cellular process that may occur. The timing of such events during the infection can also be ascertained based on the parameters that are set when the movie is being recorded. Figure 1: Field of Infected Macrophages. This figure shows an entire field of individually infected macrophages at the start of a 24 hr infection period. It should be noted that the field is free of extracellular Cn and more importantly, how clear it is which macrophages are infected (as indicated by a large arrowhead) and which contain no fungal cells (as indicated by a small arrow). Scale bar represents 50 μm. Movie 1: Visualization of Macrophage-C. neoformans 24 hr Infection Period. The initial frame of the movie shows many macrophages throughout the field with some that are uninfected and some that have phagocytized varying amounts of cryptococcal cells. As the movie progresses, the cells are all motile and can be seen moving about the field. We are able to follow each of these macrophages to see what kind of cellular process they undergo. Figure 2: Primary Murine Macrophage Undergoing Non-lytic Exocytosis. An infected macrophage (Panel A, indicated by a white arrowhead) is seen undergoing the beginning stages of non-lytic exocytosis. The phagosome starts to enlarge (panel B-C) and the fungal load starts to shift. Several Cn cells are then released into the extracellular space as can be seen in panels D-E. A second infected macrophage in Panel F, indicated by a white arrowhead, also undergoes a non-lytic exocytosis event (Panel G-H). At the end of the process, both macrophages are left empty (Panel I) as shown by the white arrowheads. Scale bar represents 25 μm. Movie 2: Visualizing Primary Murine Macrophage Undergoing Non-lytic Exocytosis. In this movie, it is clear that the cryptococcal cells are within the confines of an infected macrophage. The macrophage becomes agitated and a yeast cell can be seen budding within the phagosome. Cryptococcal cells are then quickly expunged into the surrounding environment. A second infected macrophage undergoes non-lytic exocytosis and more yeast cells are released into the extracellular space. The host cells remain viable after cryptococcal exocytosis as indicated by their ability to continue moving. Figure 3: Primary Murine Macrophage Undergoing Cell-Cell Transfer. Another process that can be captured using this protocol is cell-cell transfer which occurs when cryptococcal cells are transferred from one macrophage to a neighboring macrophage. Two infected macrophages are in close proximity to each other indicated by white arrowheads (Panel A) and move even closer to initiate cell-cell transfer (Panel B). A cell-cell bridge indicated by the red arrowheads is formed between the two macrophages such that the cryptococcal cells are not exposed to the surrounding environment during the transfer (Panel C, E). After the transfer is complete, the cells break away (Panel D, F). Scale bar represents 25 μm. Movie 3: Visualizing Cell-Cell Transfer Between Infected Macrophages. On occasion, macrophages will interact in such a way that facilitates transfer of cryptococcal cell between host cells. The yeast cells are not exposed to the extracellular environment and the host cells remain viable. In this movie, two infected macrophages create cell-cell bridges on two separate occasions to shuttle cryptococcal cells from one macrophage to another. Figure 4: Schematic showing preparation of cells. Here we have described a method by which fungal-macrophage interactions can be recorded and analyzed in real time over a 24 hr period. Our lab has used this protocol to study many of the temporal aspects of non-lytic exocytosis and will continue to use real-time microscopy to ascertain the morphological components that surround this process. For this technique to yield ideal results, special attention should be given to certain steps in the protocol. The cell density that is plated the night before is important because too many cells can create a movie that is not usable as the viewing of the movement and interactions of individual cells is hindered, while too few cells may yield data that is not significant. The goal is to achieve an evenly spaced field of macrophages such that individual macrophages can be followed for the duration of the infection period. In that same vein, washing away the extracellular Cn is a critical step as extracellular Cn will divide over time which could obscure the field and lead to a loss of visibility of the macrophages. Depending on the length of the movie, the frame can shift out of focus which makes images unusable to study and therefore, the recording needs to be checked at various points during the infection. As outlined, there are various ways this technique can be modified to fit within the parameters of other experiments. Many different fluorescent dyes and markers can be used to highlight membrane and phagosomal dynamics but one should be cautious of photo bleaching and the affect this may have on the fitness of the cells. A variety of cell types can also be used such as J774.1 macrophage-like cells, monocytes or amoebas in conjunction with other fungal strains to study the differences that may occur. We suggest using an objective of 10X because our experiments require the data collection of a large quantity of cells, however one could use a higher objective to study just a few cells. The timing that each image is taken can also be adjusted. Taking an image every 4 min for 24 hr yields a movie that runs roughly 1 minute in length when all frames have been compressed. Increasing either aspect (the duration of infection or the time between frames) increases the amount of files that need be stored which may be an issue for some laboratories. Non-lytic exocytosis is an incredibly dynamic process that occurs rapidly and at various time intervals during infection. Therefore, trying to capture macrophages undergoing this interaction using other methods such as transmission and scanning electron microscopy can be extremely rare. Due to the nature of how samples are fixed and processed, one can’t be certain that what is being viewed is definitively non-lytic exocytosis versus other cellular processes such as lysis or apoptosis. Also, a hallmark of non-lytic exocytosis is that host and pathogen remain viable afterwards which is something that cannot be deduced from fixed images since these methods can only produce snapshots of a process at a given moment. While this protocol can provide countless images of cellular processes, there are some limitations in using this technique to study host pathogen interactions. The low objective we use to study a large amount of macrophages at one time does not allow for a high enough resolution image to visualize the interaction between the phagosome and the cellular membrane, which is not a well understood aspect of non-lytic exocytosis. Once all the images have been recorded, the post analysis of following many macrophages can be very tedious and time-consuming. Macrophages, even those adhered to glass, can be very motile and will move in and out of the frame very quickly. This can make it hard to follow individual macrophages from start to finish, especially those that are near the periphery of the frame. Despite these limitations, this is protocol can be used in a variety of ways to study the many different aspects of host-pathogen interactions. The authors declare that we have no competing financial interests or other conflicts of interest. This research was supported in part by NIH awards 5T32AI07506, 5R01AI033774, 5R37AI033142, 5R01AI052733. Voelz, K., May, R. C. Cryptococcal Interactions With the Host Immune System. Eukaryotic cell. 9, (6), 835-846 (2010). Johnston, S. A., May, R. C. Cryptococcus interactions with macrophages: evasion and manipulation of the phagosome by a fungal pathogen. Cellular microbiology. 15, (3), 403-411 (2012). Sabiiti, W., May, R. C. Mechanisms of infection by the human fungal pathogen Cryptococcus neoformans. Future microbiology. 7, (11), 1297-1313 (2012). Bliska, J. B., Casadevall, A. Intracellular pathogenic bacteria and fungi — a case of convergent evolution. Nature Reviews Microbiology. 7, 165-171 (2008). Alvarez, M., Casadevall, A. Cell-to-cell spread and massive vacuole formation after Cryptococcus neoformans infection of murine macrophages. BMC immunology. 8, (1), 16 (2007). 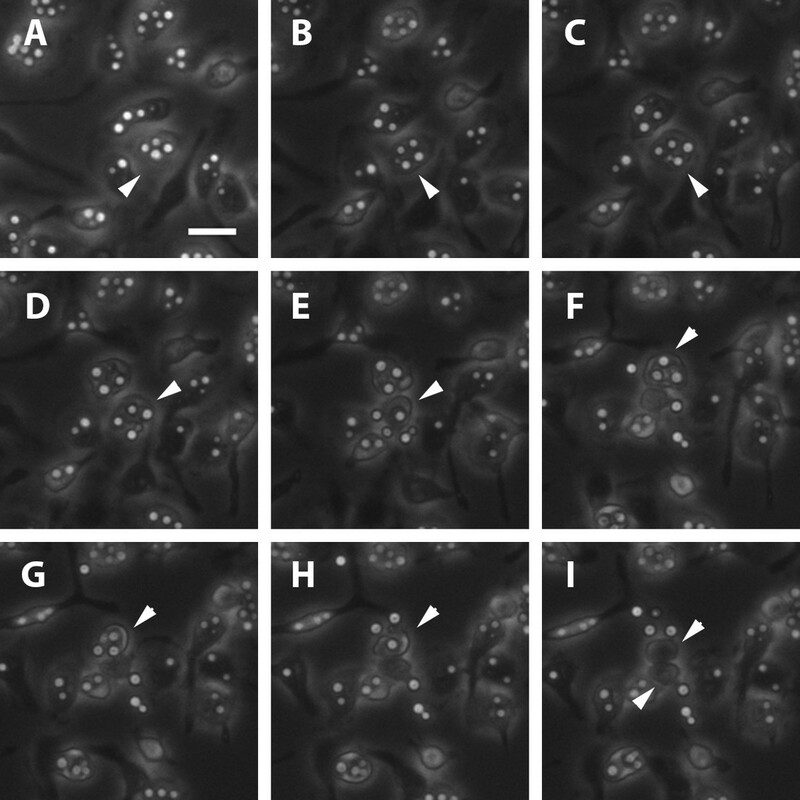 Ma, H., Croudace, J. E., Lammas, D. A., May, R. C. Direct cell-to-cell spread of a pathogenic yeast. BMC immunology. 8, 15 (2007). Alvarez, M., Casadevall, A. Phagosome extrusion and host-cell survival after Cryptococcus neoformans phagocytosis by macrophages. Curr Biol. 16, (21), 2161-2165 (2006). 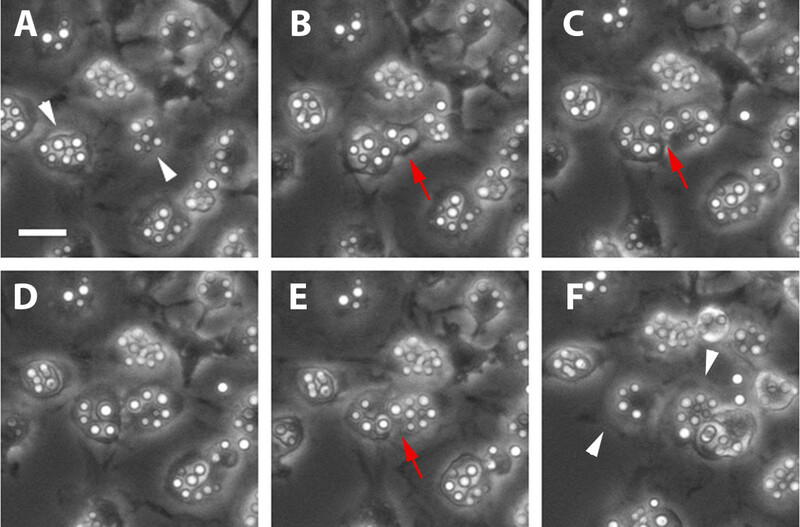 Ma, H., Croudace, J. E., Lammas, D. A., May, R. C. Expulsion of live pathogenic yeast by macrophages. Curr Biol. 16, (21), 2156-2160 (2006). Johnston, S. A., May, R. C. The human fungal pathogen Cryptococcus neoformans escapes macrophages by a phagosome emptying mechanism that is inhibited by Arp2/3 complex-mediated actin polymerisation. PLoS pathogens. 6, (8), (2010). Carnell, M., et al. Actin polymerization driven by WASH causes V-ATPase retrieval and vesicle neutralization before exocytosis. The Journal of cell biology. 193, (5), 831-839 (2011). Voelz, K., Lammas, D. A., May, R. C. Cytokine signaling regulates the outcome of intracellular macrophage parasitism by Cryptococcus neoformans. Infection and immunity. 77, (8), 3450-3457 (2009). Bain, M. J., Lewis, E. L., Okai, B., Quinn, J., Gow, A. R. N., Erwig, L. Non-lytic expulsion/exocytosis of Candida albicans from macrophages. Fungal genetics and biology. 49, (9), 677-678 (2012).